Hogmanay usually sees me sober. Don't feel sad, this is by choice - there have still been plenty parties such as the Edinburgh Hogmanay in Princes St Gardens. I mind driving home one Hogmanay from a party in Glasgow, laughing at all the pissheads crawling along the street, so drunk they couldn't stand up. When I got home I stepped out the car and - whoops! Ended up on my arse. The pavements were so slippery these people weren't drunk (well, perhaps they were), but falling victim to sheets of ice. Generally though I prefer to reflect at this time of year, burning old papers and preparing to start the new year with a blank sheet. Staring into the flames of last year's detrius, the new year's ambitions are crystallised. I want to start immediately and it seems a waste to get drunk. Let's get on with 2016 as soon as possible! Ach who am I kidding. A Happy New Year to you all! 2015 has been a quiet year. A glorious day of winter mountaineering on Arran missed due to being too late for the ferry. The Lake District visited in pishing rain. Lots of work around the house at home and pottering at weekends meeting family instead of micro-adventuring. And is it my imagination, or has 2015 had more than its fair share of wet and windy weather? But there have been highlights too. Ben Lomond via Ptarmigan ridge in sparkling snow. A circumnavigation of Lindisfarne. A gastronomic/cycling holiday in France. Beaches and unexpected celebrities of Colonsay. And one trip stands out in particular. 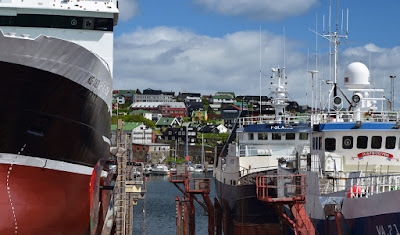 The Faroe Islands for the Torshavn Marathon. I have always wanted to visit Faroe - and the reality surpassed my dreams. In Torshavn campsite I raved about Faroe's untapped tourist potential to a Londoner who was also there for the marathon. He seemed puzzled. Who would want to come here except as a novelty? he shrugged. Me? Give me a windswept archipelago in the North Atlantic over the Mediterranean any day. And it got me thinking. The hills in Faroe are like those on Rum, except sharper, more numerous. 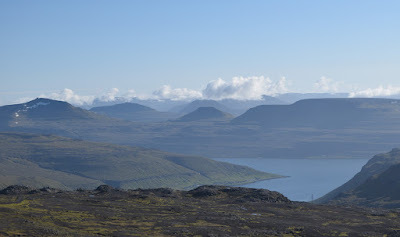 Andy Tomkins' list of Faeroese hills on Europeaklist (where I learned that Norweigans hope to gift Finland a mountain peak for Finland's 2016 centenary of independence from the Russian Empire!) 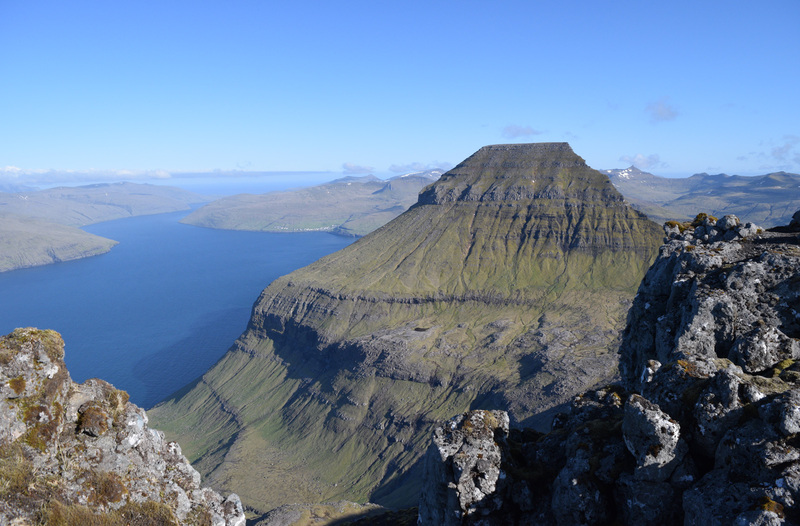 show that Faroe has double the number of Marilyn-height hills of the Lake District. It is a baggers paradise. If you can see a vista of hills like this and not want to climb them, then you are made of stronger stuff than me. So why aren't there organised tours for hillwalkers to Faroe? I inquired with some mountain guides, but heard nothing back. 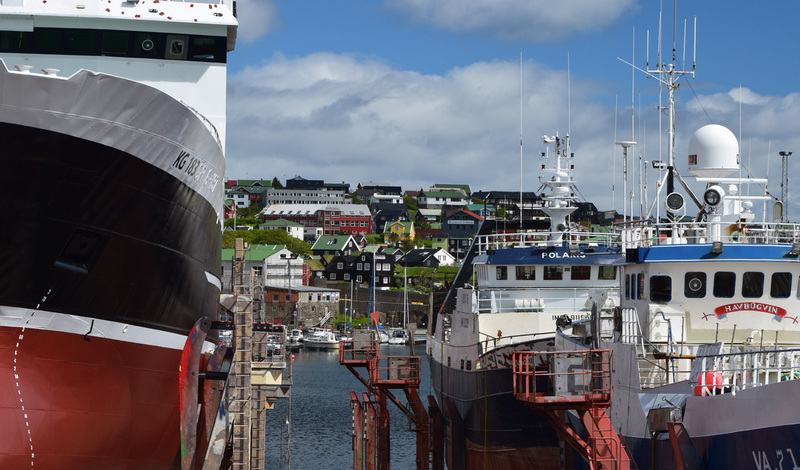 It seems that despite being so close, Faroe really is a forgotten, exotic destination. And the absolute highlight was not the marathon, our boat trip to the bird islands, or even watching the Faroes beat Greece 2-1 at football. It was the ascent of Slaettaratindur, something I've dreamed of for years. 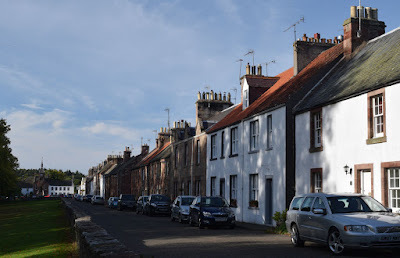 It might not be anything related to Scotland, which is the remit of this blog. But Slaettaratindur on a sunny day is hard to top. It is my memory of 2015. Rain lashing windowpanes, drumming on roofs. 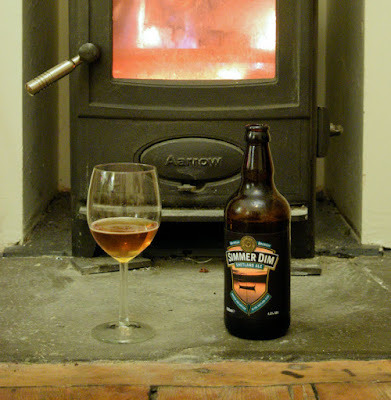 A tap of the barometer, daily ritual. A scouring, a howling, awakening. A bare tree, wet black and bending. The last leaves trembling. Small birds blown like scraps. We march past puddles, the only pedestrians. A great arc of seagulls, black against a torn sky. Hard houses in rain-smudged rows. The town illuminations, swaying in the storm. A bustle of scarves and coats in doorway. Lowland Hills. An oxymoron, surely? 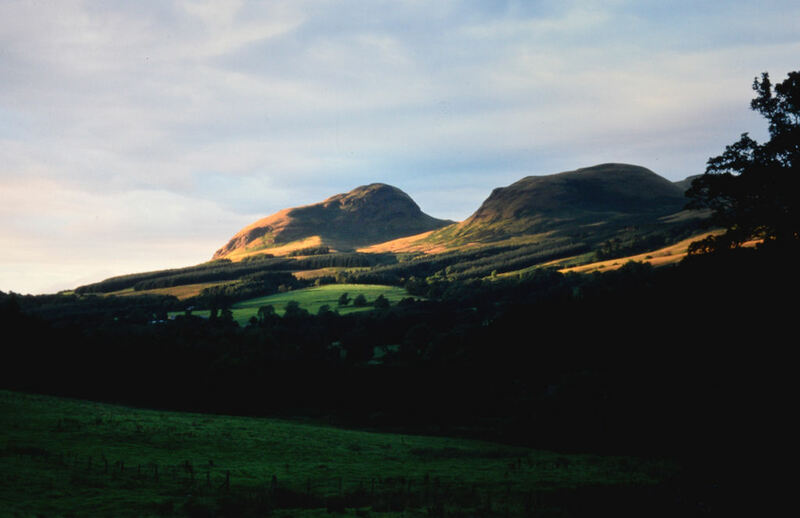 Yet the Lowlands are studded with wee hill ranges, from individual peaks such as Berwick Law or the Dumpling, to substantial massifs such as the 721m high Ochils, a dramatic escarpment rising above the flat plain of the Forth. And the best thing about them? For 80% of Scotland's population - including me - they are right there on the doorstep. I love hillwalking. But sometimes it just isn't practical to get away for a whole day. And the onset of winter brings fresh imperatives - short daylight, and a desire not to spend hours on the road in the dark. Well, there are plenty of leg-stretching options available within an hours' drive of home. What about a traverse up steep gorges onto the flat, sun-flooded plateau of the Ochils and a descent past a mediaeval castle? 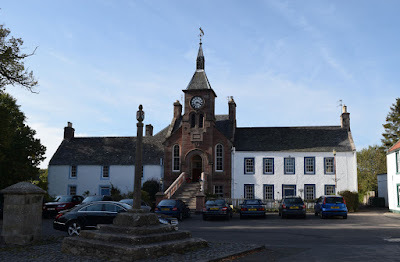 A wander up the worn rhinoceros horn of Dumgoyne, round the rim of the vast, untrodden Corrie of Balglass, and down past the beautiful Spout of Ballagan in the Campsies? 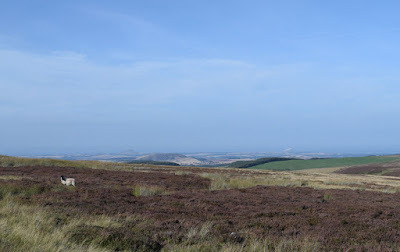 A trek past the Bonnet Stane in the Lomond Hills of Fife, followed by a high-level escarpment walk round three grassy peaks of volcanic origin? Or what about my nearest hills, the Pentlands? 13 minutes drive according to the AA Route planner. Thirteen minutes, and I am on my way up here. Exercised, ruddy-cheeked with wind, skin flooded with Vitamin D, in good company if I'm lucky, a bit of perspective put on the world bustling about its business at our feet. 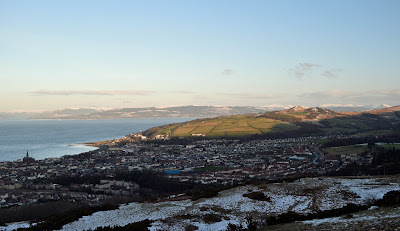 This is the view from Allermuir Hill, right on the outskirts of Edinburgh - so close to town in fact that you can get a city bus to Hillend at the hill's base. The Lowland Hills. I can thoroughly recommend them. A battered sea-front, waves crashing on the shore. That was the scene this week when storm Abigail, the first of the winter, hit the Ayrshire coast. What wasn't seen this week was the largest Viking fleet ever assembled riding out the storm offshore. But under similar conditions, that was exactly the view in 1263. 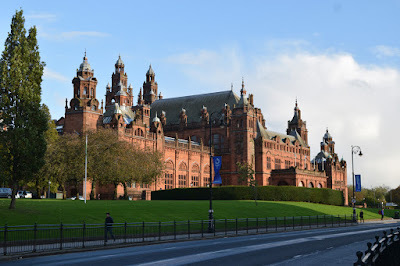 For how many people today know that the Clyde was once an international frontier between Scotland and Norway's empire? 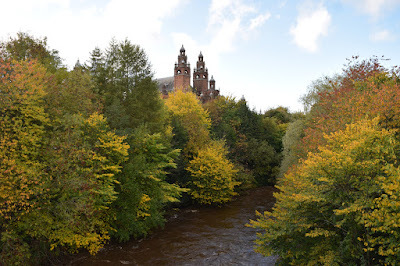 For decades, Scottish kings had been claiming the islands of the Clyde and Western coasts, territory belonging to the Norwegian king through conquest. Alexander II died in 1249 campaigning near Oban against forces loyal to Haakon IV. His successor Alexander III continued pressing the claim. Eventually the elderly Haakon had enough, and ordered a great fleet to be assembled. His own galley was trimmed with gold and the dragons head prow. At least 120 longships sailed from Bergen in July, gathering more men as they reached Scotland and reaffirming his rule from Shetland to Man. On hearing of Haakon's progress, the Scottish king gathered his Norman knights in the pastoral fields of Ayrshire and waited, in view of the Norse islands of the Clyde. 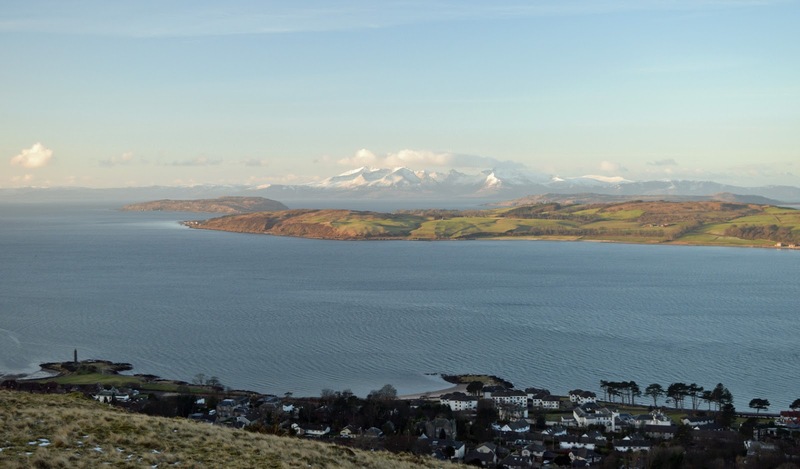 For despite Scottish consolidation on the Lowland side, the Clyde remained a Norwegian sea. Haakon sailed up the Clyde, and a stand-off began at Largs. Alexander couldn't take the battle to Haakon - the Norwegian king was unbeatable amongst the islands and at sea. Yet neither could Haakon engage - his Viking warriors would not have been able to withstand Alexander's heavily armoured, mounted knights on land. And so the two forces sat, paralysed, parleying. 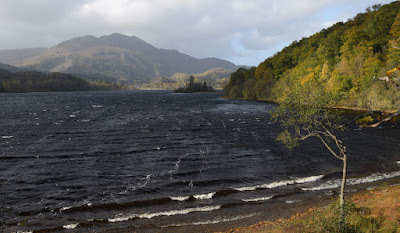 Haakon sent a diversionary force up Loch Long and down Loch Lomond to Dumbarton, burning and pillaging the surrounding countryside as they went. But Alexander stayed fast. For he knew that winter was coming, and the longer that negotiations continued, the better his chances of success. And so it proved. On the night of 30 September, the first fierce storm of winter hit the coast. A number of Norwegian longships slipped their anchors and were beached at Largs. Local levies fell on them, beating them back, until they were reinforced by Haakon himself. The next day the main Scottish force arrived and forced the beached Norweigans to take to sea again. But the Norwegians countered, ending up in possession of the beach on the night of 2 October. Come morning they made an orderly withdrawl. Haakon headed out by Arran where he had more sea room in the storm, and was re-joined by his Loch Lomond party. But it was too late for any further battles. Vikings were strictly summer warriors, the winter seas too hazardous. Haakon withdrew to Orkney, where he died in December. In 1266, his successor Magnus VI signed a peace treaty with Alexander and sold the Hebrides and Isle of Man to the Scots king for a large quantity of silver. 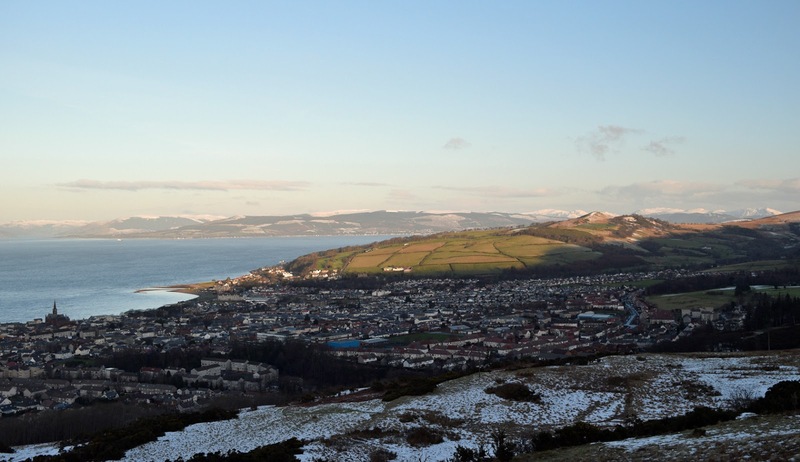 The fighting at the Battle of Largs was desultory, and at the time it was seen as a minor engagement. But hindsight has given it greater prominence, as it proved to be the final battle between Viking and Scot. It led to the Hebrides finally coming into the orbit of the Scottish monarch after spending nearly four hundred years under the nominal control of Norway. 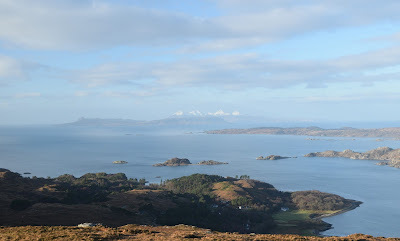 And that is perhaps the final eye-opener in this story - that islands that are now considered so quintessentially Scottish, were once as Norwegian as roll-mop herring and trolls. A mighty wind terrorised the trees lining the A84. A swirl of leaves filled the air, sun caught in vigorous death. The forecast gale had materialised. A Munro in Breadalbane seemed a punishment exercise in such conditions. But it was too sunny to do nothing. 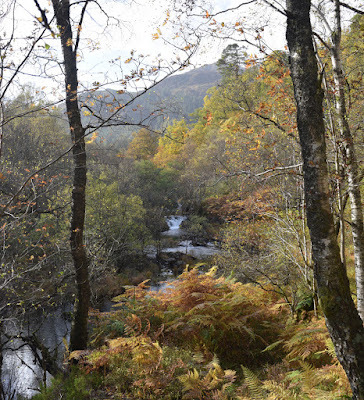 A forest walk... a lochside... a half-height hill perhaps? The solution came to us both at once. 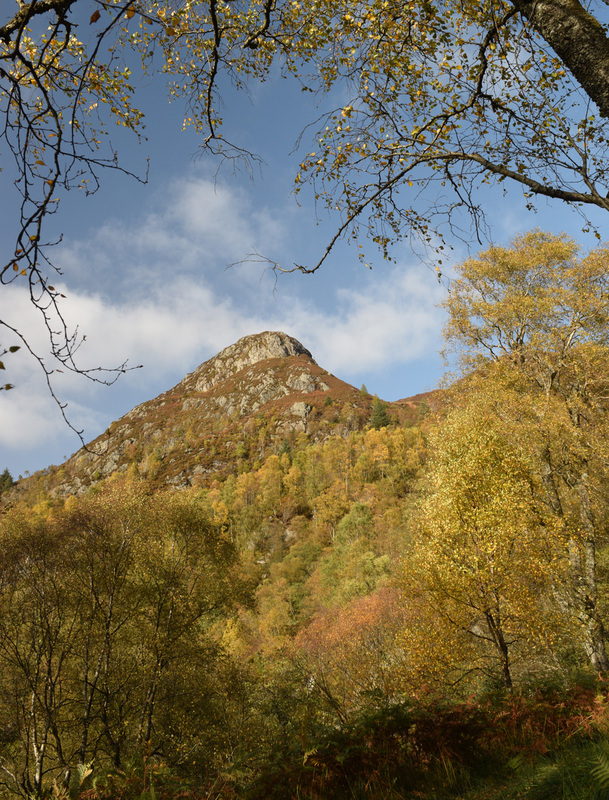 Ben A'an in the Trossachs. Beauty without exposure. And the opportunity to explore some of the newly-opened Great Trossachs Trail, which runs from Inversnaid on Loch Lomond to Callander, home of the world's earliest recorded organised football match. 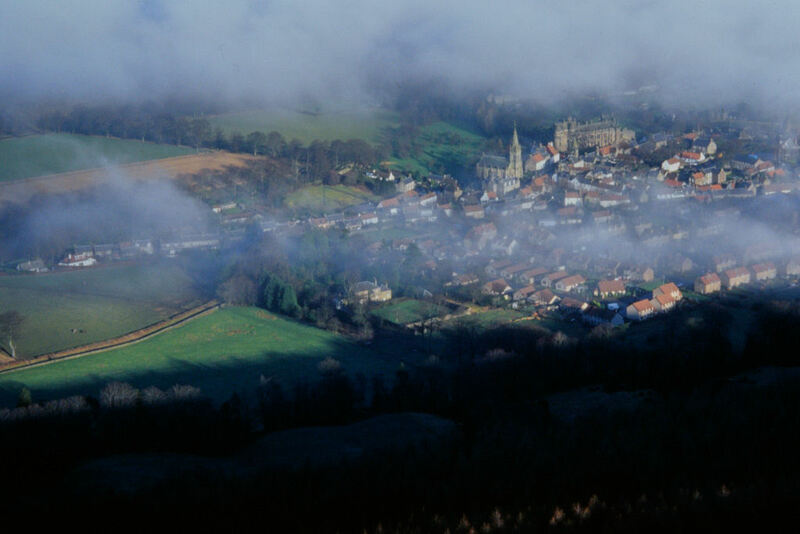 Arrival in the Trossachs is heralded by a shaggy Highland cow at Callander then the small, wooded hills of frontier country. 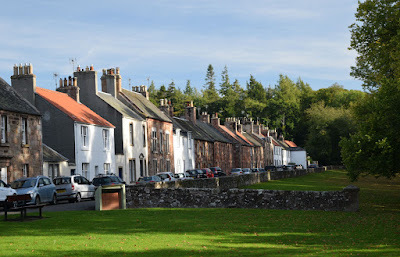 This was the first tourist area in Scotland, made popular by Sir Walter Scott, but as he is unfashionable these days I promise not to mention him. 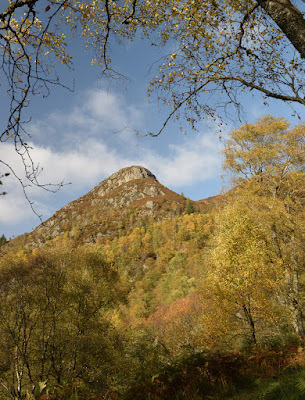 The intention was to repeat a previous walk - a circuit of Ben A'an and a wander along Loch Katrine, with a return on a section of forest road rebranded as the Great Trossachs Way. Sometimes though events conspire against plans made in the comfort of your home, and that happened here. Where was the path up Ben A'an? It has disappeared into an area of fenced-off forestry felling. 'Alternative route Ben Venue car park' said a sign. I wasn't aware there was a Ben Venue car park. We found it, and started our walk on the alternative path. Slippery, slidy, muddy... Ben A'an's modest altitude was hard gained. But what a hill it is! Seemingly steep and impregnable, it is in fact quite easy. The sun was still out on the top, the only other people here a holidaying German family asking for a photo. They had climbed a hill in the Trossachs and seen a Highland cow in a field by Loch Achray. They looked like they were having a fantastic time. Well, wouldn't you? We descended west from Ben A'an, a little-known route that allows you to walk a circuit rather than head back down the muddy path. I had come this way before, but this time messed up. The trick on reaching a fence is to *not* cross it at a stile, but follow it down to a stream and then follow this to Loch Katrine. Instead we crossed the stile and became lost in a wilderness of heather, bracken and oozing bog. A huge stag watched us for a while from the forest below, wondering what we were up to, before legging it, muscles rippling under his shaggy coat. It is a good thing deer aren't aggressive creatures. After this wrong turning the stuffing had been knocked out of me. 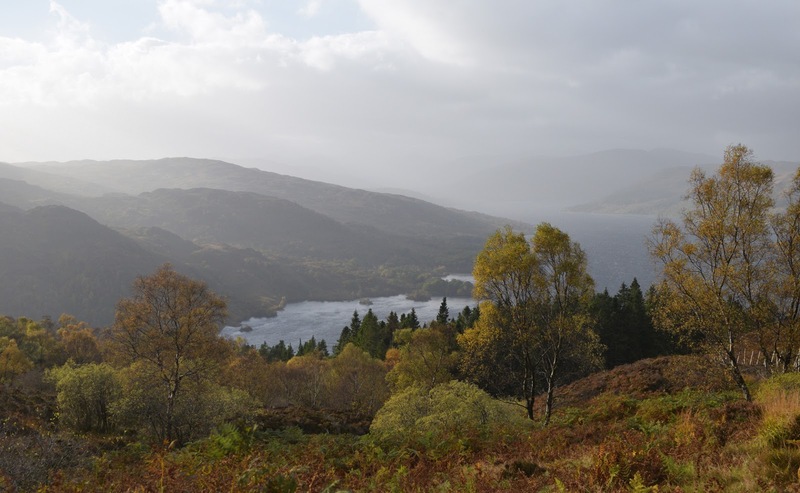 It had started to dull over and I wasn't fully convinced I would find the right way down to Loch Katrine. (In retrospect, if we had just kept going a bit longer we would have found a way down.) 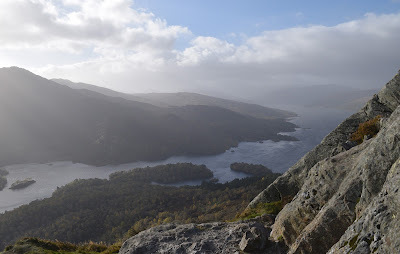 So we retraced our steps back to the top of Ben A'an and down the slippery ascent route. Beaten by Ben A'an! I thought I was made of sterner stuff, but the hills always have a lesson to teach us. 'Land of heath and shaggy wood' indeed. 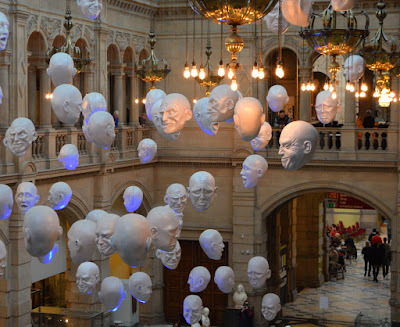 Did I say earlier I wouldn't mention Sir Walter Scott? Damn. Autumn. A time of year that conjures thoughts of trips to leafy areas. The waterfalls of Deeside, neatly laid out tourist trails of Dunkeld, or perhaps taking to the water in the Great Glen or the Trossachs? But there is no need to go so far. 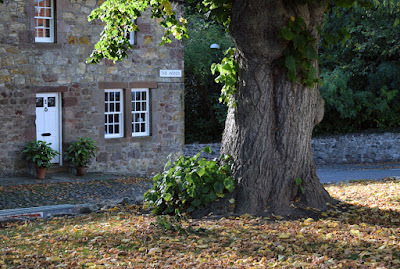 There are leafy areas in all of Scotland's cities. Why travel, when you can stroll around Glasgow's West End? Is there any need to go far when crisp air, welcome sunshine, and lovely views can be gained just as easily wandering around Edinburgh's Botanic Gardens and Water of Leith? When the leaves are still on the trees, the sun is out, and the air still, take advantage of it. Get outside from your city job and refresh your spirit. Soak up the vitamin D. It is the last good day of the year and should be enjoyed. There will be plenty days of rain-lashed gloom ahead. There is something you notice though if, like me, you are drawn to leafy areas at this time of year. It is almost axiomatic that the leafier the neighbourhood, the wealthier it is. While it costs nothing to wander where you will in our cities, why should poorer areas not also enjoy the benefits of trees? I am sure there would be major health benefits. Town planners, please take note. 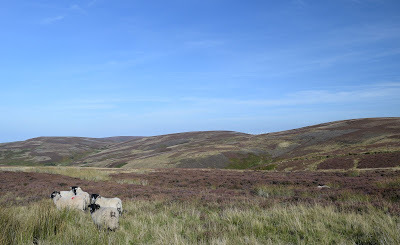 High in the Lammermuirs and the heather has turned. 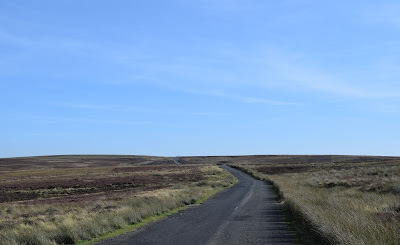 This flat-topped moorland plateau is traversed by quiet roads, of which the B6355 carries National Cycle Route 1, the cycle route that follows the North Sea coast. (The A1 follows the actual coast but is unpleasant and dangerous for cyclists.) 'Allez Evans' it says at the top of a steep climb, painted on the road surface by a cycling fan. To the south, the road gradually folds you closer into the Borders, winding down with the Whiteadder towards the Merse and the Tweed. To the north, the lowlands of East Lothian, pale with ripened wheat. 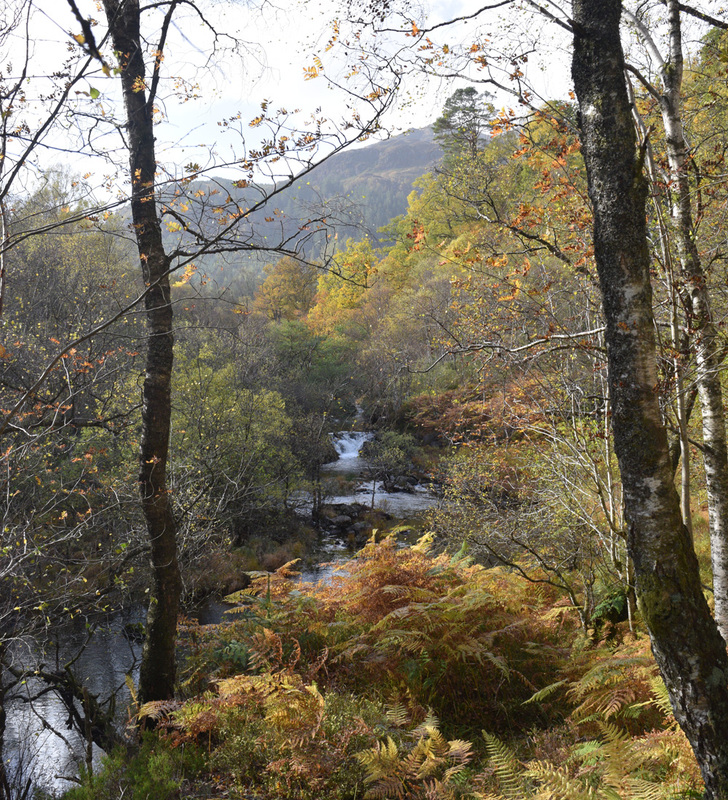 Continue pedalling and you reach Gifford, basking in rare autumn sunshine. From the bar of the village hotel, the sounds of the Rugby World Cup on TV. Cyclists on the green, refuelling and adjusting their wheels. I am more used to wishing to be in the Highlands in this weather. But if you have to spend a beautiful autumn day in the Lowlands, you can do worse than cycling round East Lothian and the Lammermuirs.